Ladies and gentlemen, the One Room Challenge reveal is finally here! In the last six insanely overwhelming fun weeks, we've taken our living room from blah to beautiful – and today I'm taking YOU on a tour to see the fruit of our labor. But first: a quick story, because it's cool and quirky and fun – all the things I strive to be, but alas, am not. In July 2015 the husband and I happened upon some investment property – nearly seven acres of property, to be exact. On that property stood an abandoned bungalow, originally built in 1930 and left to rot for the last 20 years. Like any rational and sane couple, our immediate reaction was, "Can you imagine the fun we'd have renovating this house?" Oh, how young and naive we were... Ha! Fast forward 17 months, during which we gutted and renovated the entire house. We moved in a mere two months ago, despite the barely livable state of the house. Then October rolled around, and I had made zero progress with the decor. The One Room Challenge was just the stressor I needed to help me move past my DPS (Decision Paralysis Syndrome – I promise it's a thing!). Okay, cool background story over. Let's take a tour, shall we? 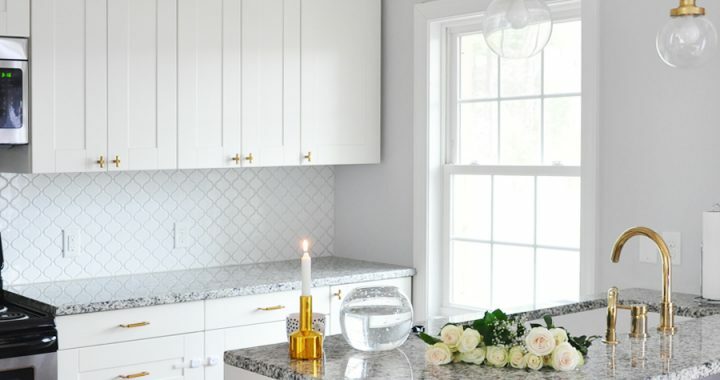 My goal was to create a space that felt honest – a space that didn't take itself too seriously, because if this article is any indication, that's just not who we are. Think modern, clean lines effortlessly combined with traditional pieces in a polished way but with a touch of playfulness so as to not look too formal. Until the very last minute, I envisioned a particular layout, but when the furniture finally arrived and was arranged as planned, I realized the flow of the room wasn't, well, flowing. Cue last-minute panic and furniture rearranging into the wee hours of the morning. Choosing a favorite feature of the transformation is like choosing a favorite child (I don't even have children, so what do I know, right? ), but I am particularly pleased with the fireplace makeover and could not have done it without the husband's mind-blowing talent and dedication. Gone are the days of seeing a decrepit, crumbling heap of discolored bricks the minute you step into the house. 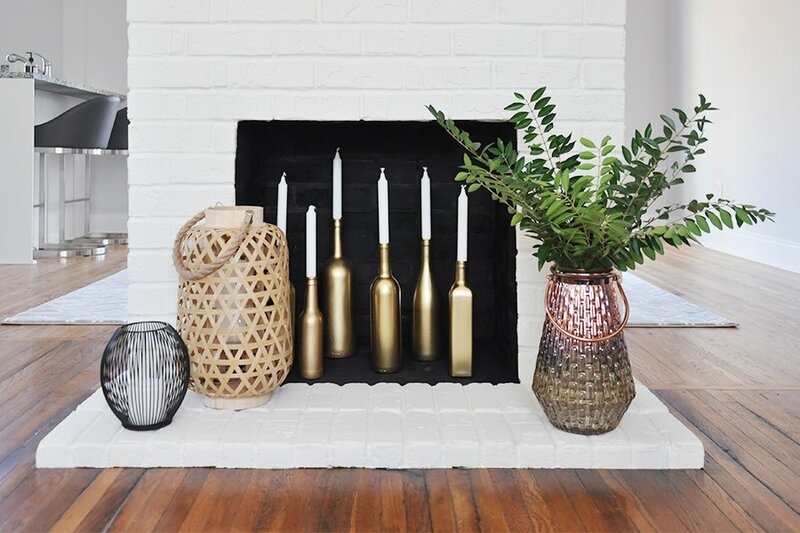 Now, whether you're in the entryway, hallway, kitchen, dining or living room, you have a clear view of the fireplace in all of its fresh and renovated glory. The design began with the chrome Sputnik chandelier. It was installed long before I even knew about the One Room Challenge – or that I'd risk losing what's left of my sanity to join it. 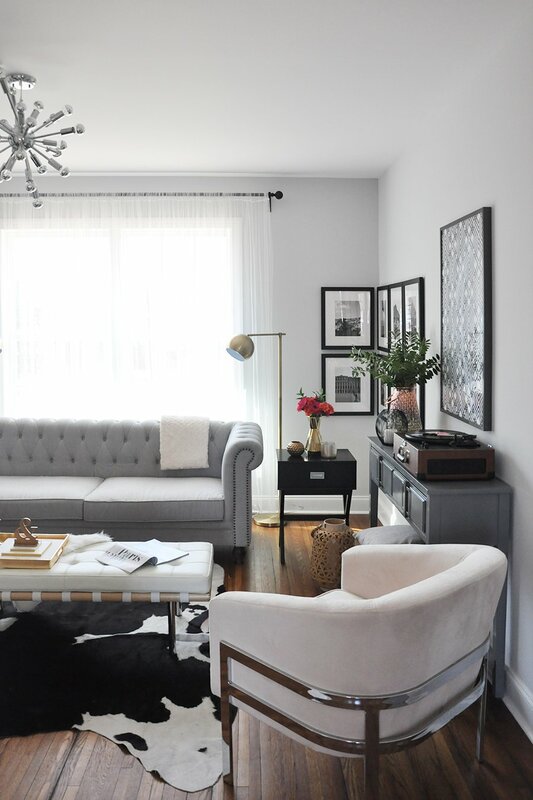 I had pinned enough images in my lifetime to know that a bold light fixture, like "The Sol" from PureModern, was destined to hang over a traditional Chesterfield sofa. Coincidentally, I ordered said sofa way before the One Room Challenge – and good thing I did, because it took nearly seven weeks to arrive. Oh, the stress of it all! 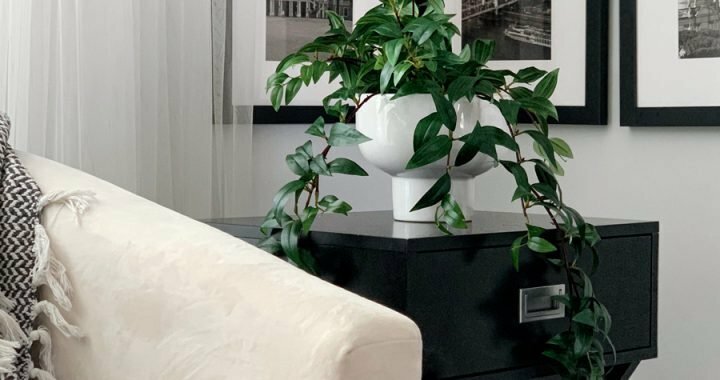 The decision to flank the sofa with black side tables on either side came very much at the last minute, but I love having additional storage – not to mention more surface to re-arrange my tchotchkes on the daily like a crazed woman on a mission. I turned the velvet barrel chairs ever-so-slightly away from the dining room and kitchen area to create a sense of space in the open concept layout. Off to the right stands a newly painted console table that houses our record player and growing collection of vinyls. The double-shelf design provides extra storage for pillows and the mandatory pretties. 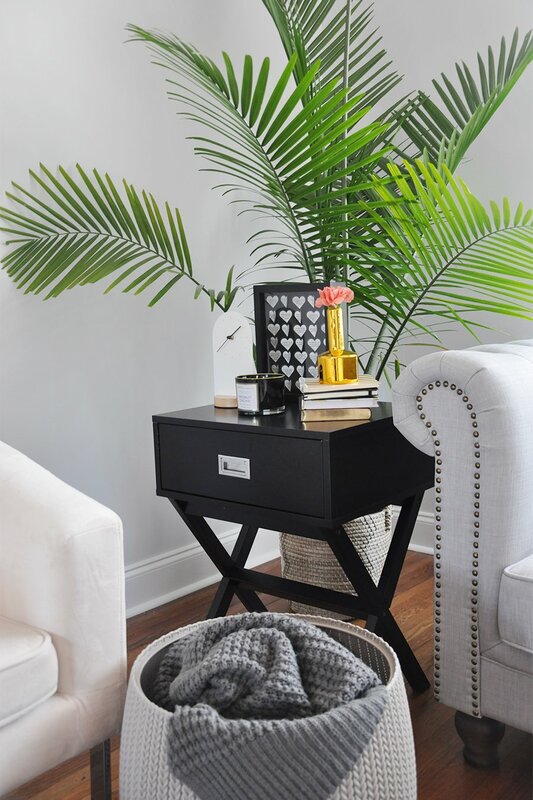 In the center of it all is a pretty yet functional leather-bench-turned-coffee table – the perfect piece on which to prop up your feet after a long day. The neutral color palette throughout the room is punctuated by a generous dose of brass and chrome, adding major visual interest to the space. 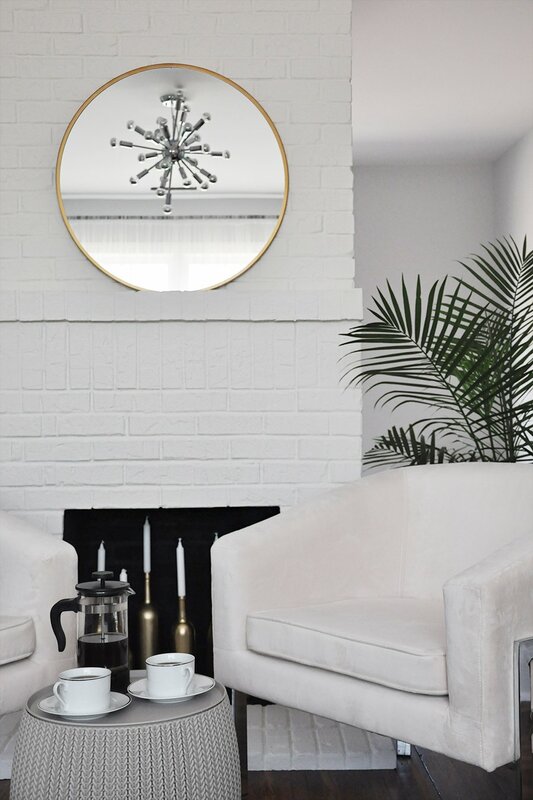 The cool chrome of the barrel chair frames, the Sputnik chandelier and the leather bench legs lends a bit of polish to the space, while the brass of the floor lamps, mirror and various accessories around the room adds warmth. 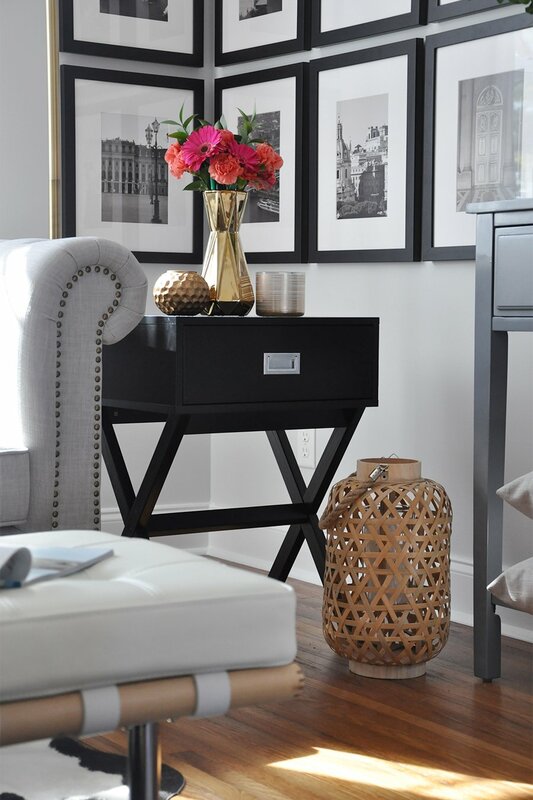 With each piece of furniture I selected, I wanted to incorporate a new texture into the room. Thus, we have the Chesterfield tufts, tack trim on the sofa arms, velvet fabric of the barrel chairs, leather from the bench and record player, rattan from various baskets and planters, and, of course, the brickwork from the fireplace. 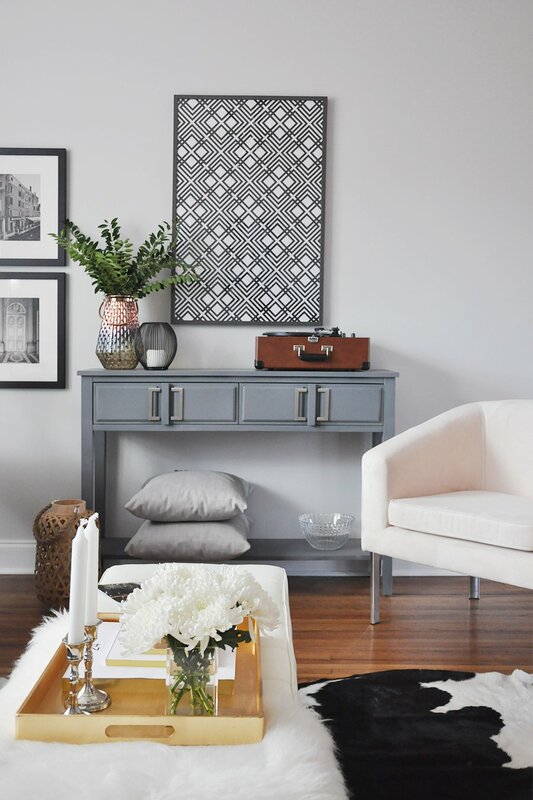 These elements help create a lived-in, cozy aesthetic that feels like it was curated over time. Moving on to the artwork, I installed large, geometric prints on both walls perpendicular to the sofa for major visual impact – far less commitment than wallpaper, not to mention so much easier to install. I designed the prints myself and printed them as engineering prints at Staples for a whopping $3.59 each. 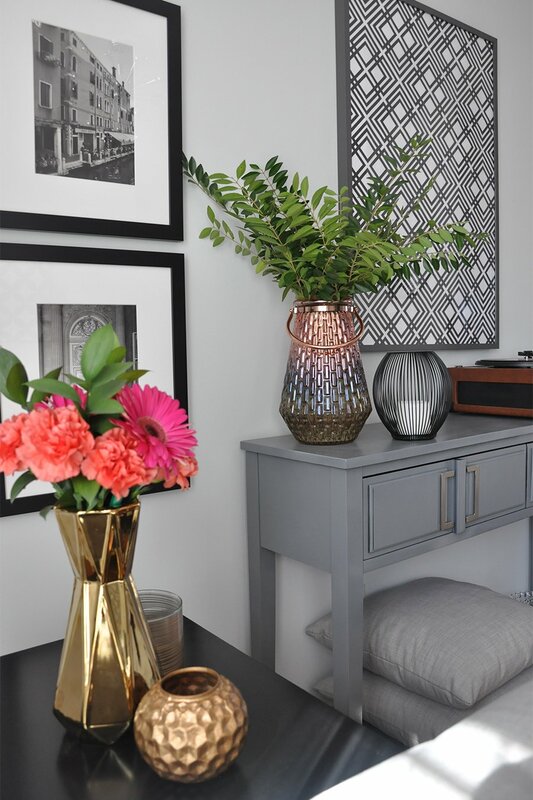 Bold, beautiful and budget-friendly? Sign me up! To the left of the console table, we installed a custom gallery wall from framed & matted that showcases some of our favorite destinations from our three-month trip across Europe a few years ago. Notice how the frames wrap around the perpendicular wall, keeping the arrangement from feeling too formal, as is common with a grid layout. 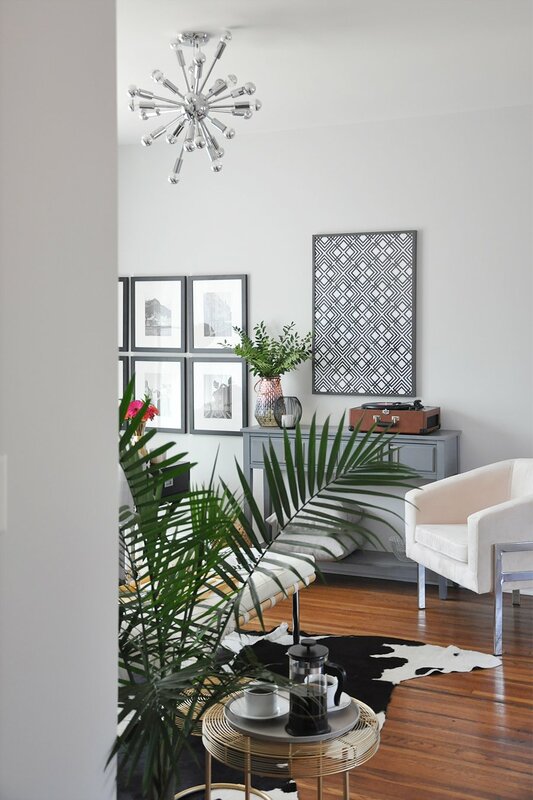 To balance out the straight edges in the room, I added a cowhide rug over the re-finished hardwood floors. 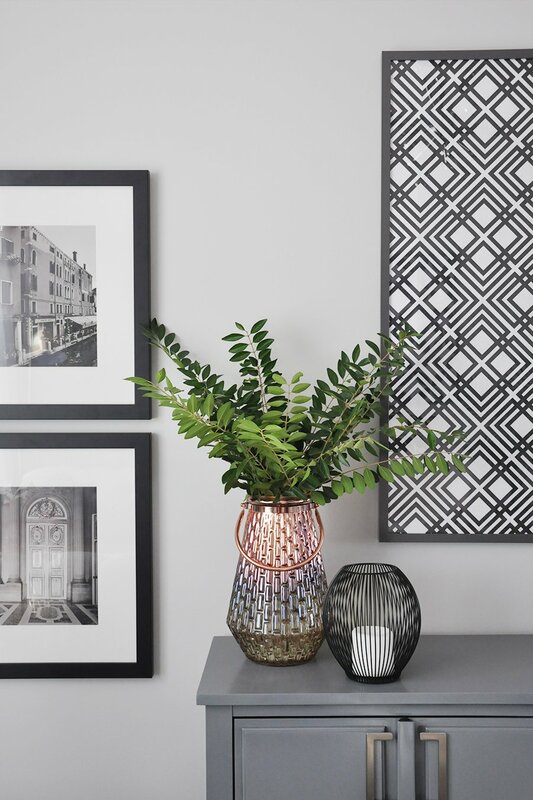 The organic shape and texture adds the perfect dose of masculinity and ties in the other black and white elements in the room. Okay, wow – that was a lot! Apparently, I have a lot of feelings about this room, and I am clearly not afraid to share them. See below for a complete list of sources, and if there's something I missed, let me know in the comments section, below! Speaking of comments, I would love to hear what you think of our transformation! Did you enjoy the tour? Don't forget to pop over to Calling It Home to see the other participants’ room tours. Curious about what else we've done to the #StrelkovBungalow, as I've lovingly nicknamed it on Instagram? Browse the full “Our Bungalow Renovation” series to read all about it! Major gratitude to Linda from Calling It Home and House Beautiful Magazine for making this amazing design event possible. 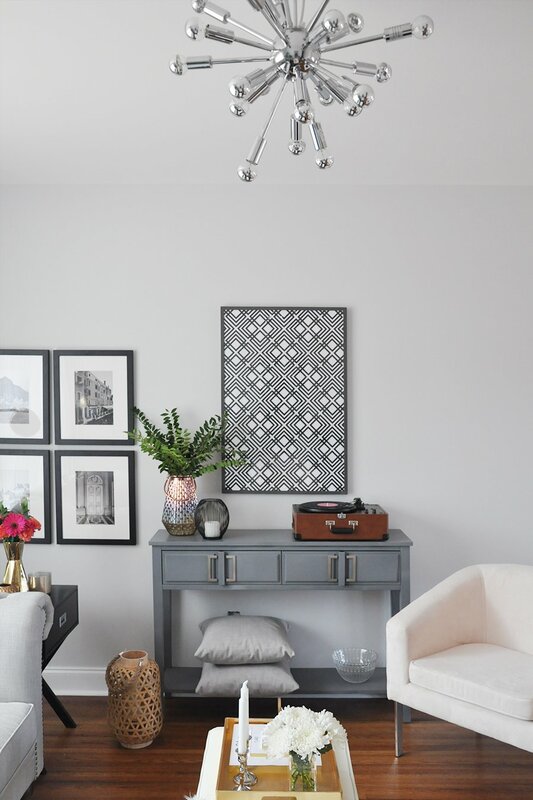 I'd also like to thank the sponsors of my One Room Challenge, who so generously donated products to our living room renovation: PureModern for our Sputnik-style chandelier, framed & matted for our beautiful, custom gallery wall and Umbra for the modern table clock. 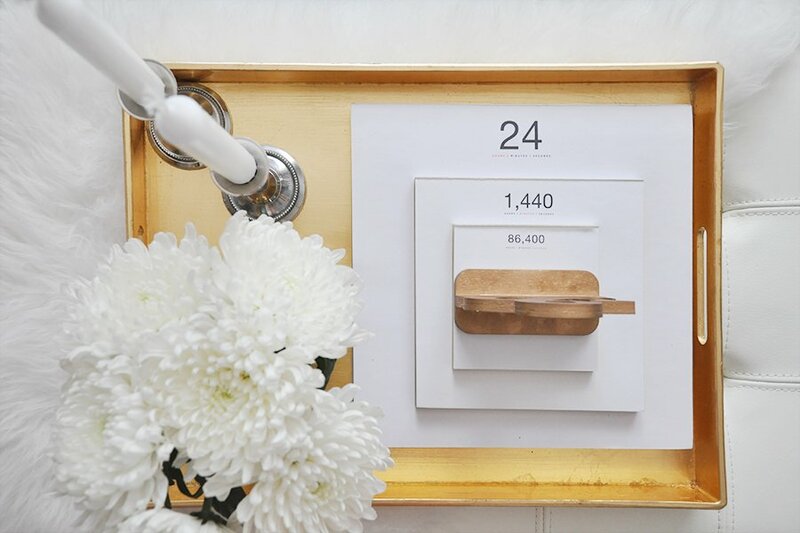 The One Room Challenge (ORC) is a wildly anticipated design event hosted by Calling It Home in partnership with House Beautiful. 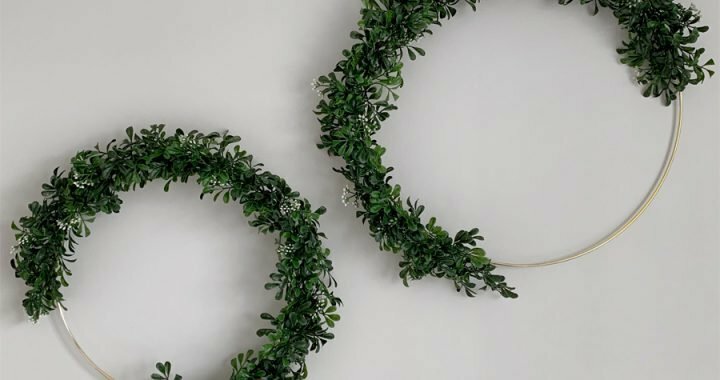 Twice a year, 20 featured bloggers along with hundreds of guest participants are challenged to transform any room they so choose, but they must complete the entire project in six weeks. 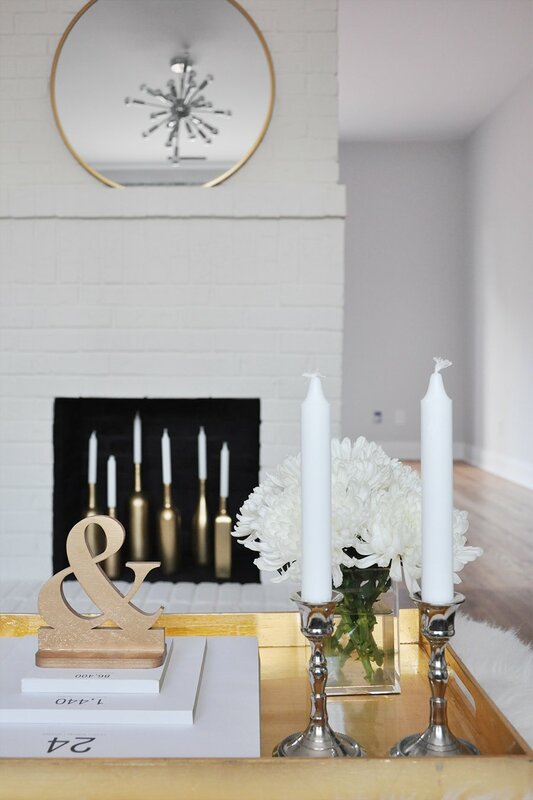 Posted in HOME DECOR, OUR BUNGALOW RENOVATION and tagged FIREPLACE, LIVING ROOM, ONE ROOM CHALLENGE. 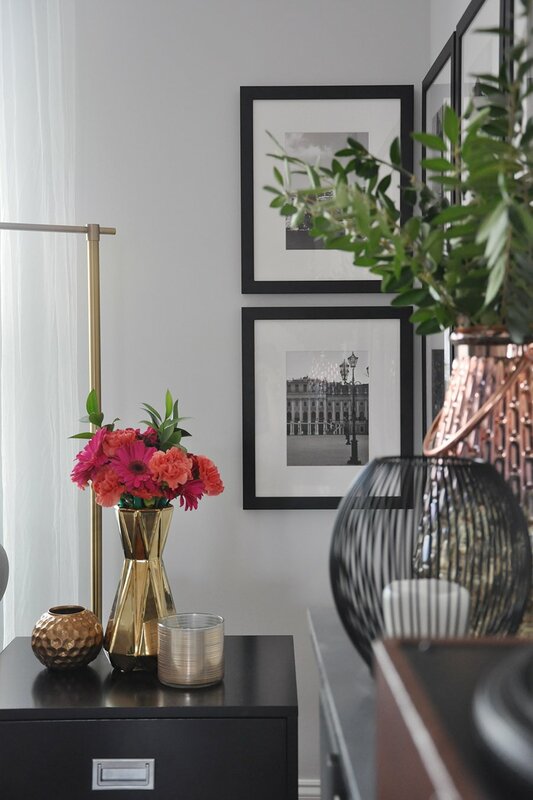 I was wondering if you could mix chrome with brass but your room proves how fabulous and interesting that looks! Tremendous job on this room. So beautiful! May I ask the wall color/paint you used? Thanks! Absolutely in love with your barrel chair & the wrapped photography wall. You have great style Oksana! It is coming along so beautifully! I love the modern touches. The rug is so fun! Can’t wait to decorate a space of my own. Ahh I absolutely love how your room turned out! This looks absolutely amazing… can you come decorate my house??? Looks amazing Oksana. I especially love the DIY art and your barrel chairs. You must be so happy to have this room done. Enjoy! I love seeing how far your little bungalow has come! This is so beautiful. I am in love with the way you arranged the photos! Such a fun idea! 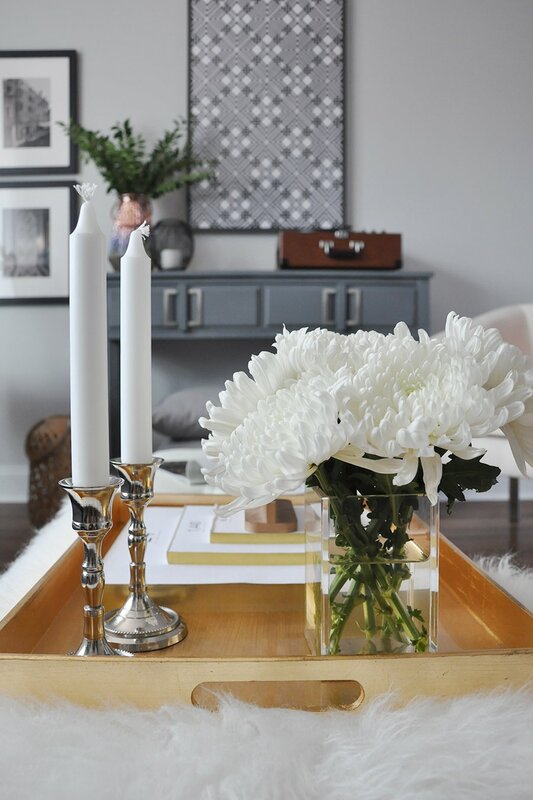 Oksana, I was initially attracted to your One Room Challenge project because of your name (I have a grand-daughter named Oksana), but then was so impressed by the photos of the reveal that I had to go back & read from Week One all the way through. Your room is one of the most beautiful I’ve seen. And the bungalow renovation! You are clearly very talented, both in design and writing. Now, I will have to start from the beginning of your blog to see what other gorgeous & inspiring projects you have done. Oksana I am so blown away by this. Your attention to detail is just UNBELIEVABLE. Every single thing is done to perfection. I’ve had so much fun following along with you on this journey! Hope to do it again in April!!! Thank you Carissa!! Thankful for your support throughout the challenge! I’m thinking of tackling either our dining room, master or guest bedroom next – what about you? Your style is as stylish as your name. Love the elegance in the setup. Loving the fireplace recreation….magical and the ottoman bench is beautiful, I will look up the source from your pin…Love, love your work. I received the photo shoot pics very late in evening from the photographer and managed putting them all together at 2AM. Please check now. Much thanks again! Wow it came out so great!! 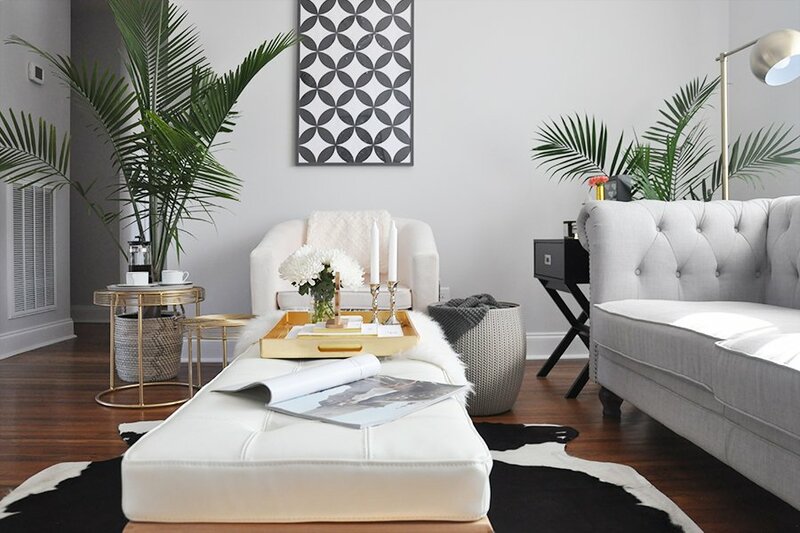 The whole room looks so chic and beautiful–I love everything! You have such a great eye for detail. I’m obsessed! Amazing! 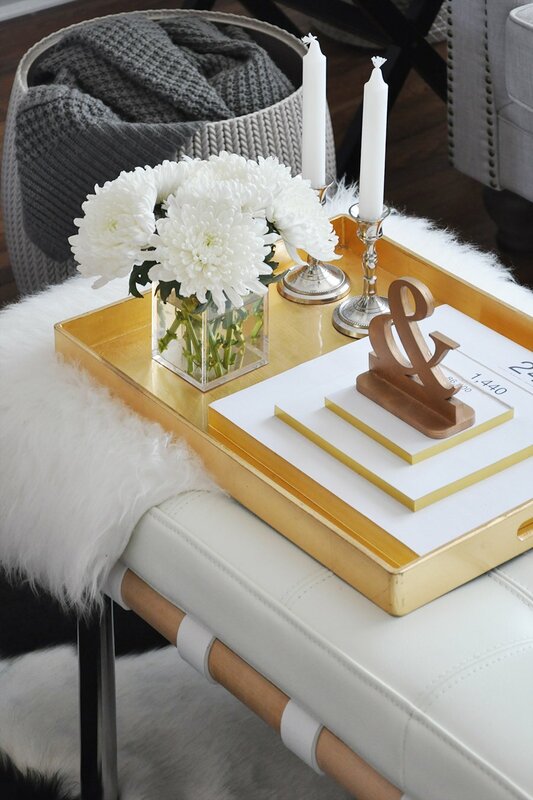 I love all of your touches of gold…so many great ideas-it is hard to choose my favorite! the dedication you have put into your decor is straight up inspiring haha.. but looks like it paid off! this is gorgeous! Glad to hear it, Elly! Thanks for your kind words. Karen, thank you so much! I was a bit anxious about the gallery wall – it was a totally last-minute decision to wrap it around the corner, but so far most of the responses have been positive! As for the sofa, I’m always nervous to order large pieces of furniture online before seeing them in person, so I was very pleasantly surprised (and relieved!) by the high quality of the sofa! Great room until I realized something. The cowhide rag thing is disturbing. I once saw a video of a cow being skinned ALIVE for its hide (primary goal was the hide, not meat) – since then whenever I see a cowhide I start to feel very sad, and start to wonder if people could picture the act of a cow being skinned alive and associate their uber stylish new rag with it, if they would still want that in their house:(..
Hi Dasha! Thanks so much for stopping by and sharing your thoughts! You bring up a good point, and to be honest, when I was ordering the rug, I was 100% certain it was faux hide. Not only was the price incredibly low, but the product description was all “handmade!” and “eco-friendly!” So imagine my shock when the rug arrived with a letter of authenticity, describing how the cows are European-bred and so on. Immediately I recalled growing up in a Ukrainian village and seeing with my own eyes how the cows would cry as they’re being lead to the slaughterhouse – and of course I wanted no part of that. The husband and I talked it over, however, and made a decision that works for our family – and that’s what it ultimately comes down to. If we return the rug then we better return the leather bench, the leather record player (just from the living room alone) and, of course, boycott steakhouses, ban meat from the fridge and so forth – otherwise we’re being total hypocrites. I do appreciate you sharing your opinion even if it’s different than mine and hope that the rug doesn’t cloud the main point of this post. Oksana!!! You nailed it. I knew you would. That fireplace is EVERYTHING! Bravo!!!! I love the intimate setting next to the fireplace with your barrel chairs. So chic and glamorous. Styled to perfection! Happy Reveal Day and get lots of rest knowing that you have completed this stunning room! Ha! I was waiting for you to comment on the barrel chairs around the fireplace! ;) Thank you for that idea! I do have grand plans for the weekend of doing absolutely nothing, save for lounging on the sofa – but I’m the type that needs to feel productive 110% of the time, so I’m sure by Saturday morning I’ll be working on another room. LOL We do have out-of-town relatives coming in a week – and both of the guest rooms are stuffed to the ceiling with packed boxes from our move, so I think I’ll tackle that next! What’s your next big project? I love how this turned out! This room is beautiful! Your space came out AH-MAZING! Absolutely love everything about it! Thank you Rachel, we love it too! It is so beautiful!! I love your sofa – I did our living room in the last ORC and ordered the same sofa but in a linen colour. Such a beautiful piece!! Fantastic job on this makeover! Your master bedroom makeover is incredible and gives me all sorts of inspiration for (finally) finishing our own. Will you be participating in the next ORC? I adore how the challenge brings people together – I’m so emotionally invested into everyone’s makeovers as if it’s my own house. Ha! Oh yes, now that the challenge is over, the husband and I are like, “Um, what do people do in the evenings after they come home from work?” For six weeks straight every evening was dedicated to the ORC, but it’s so nice to finally have some free time to, just like you said it, relax on the sofa. GIRL.FRIEND.IT.LOOKS.AMAZING!!!!!!!!!!!! I’m so, so happy to finally see all of the pieces together and both you & the hubby should be incredibly proud of yourselves. This space has been COMPLETELY transformed and looks beautiful – congratulations!! Girl! You rocked the challenge! I love your simple modern room! The textures are evident and the brass makes the neutrals pop! 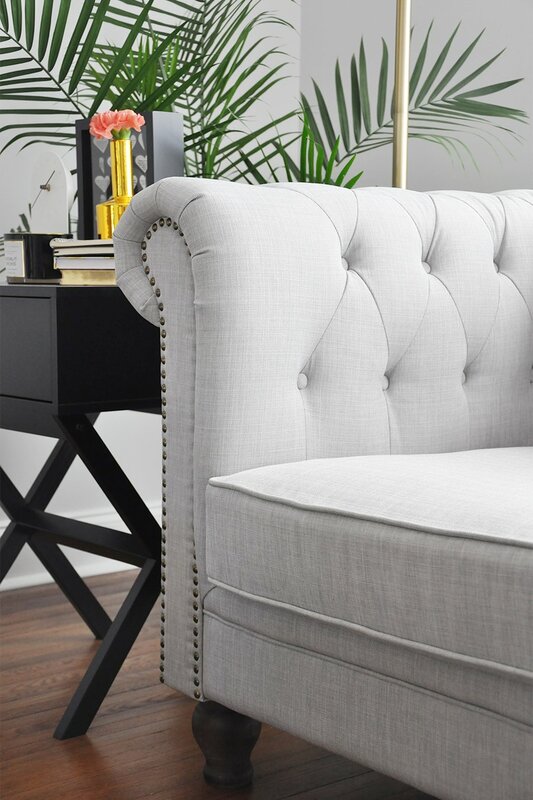 Who doesn’t love a Chesterfield sofa? Wow! Such a stunning space – bravo! I love the frames around the corner like that. I would have never thought to do that but it looks so interesting! Great job! I’m so in love with this space!! Looks SO great! 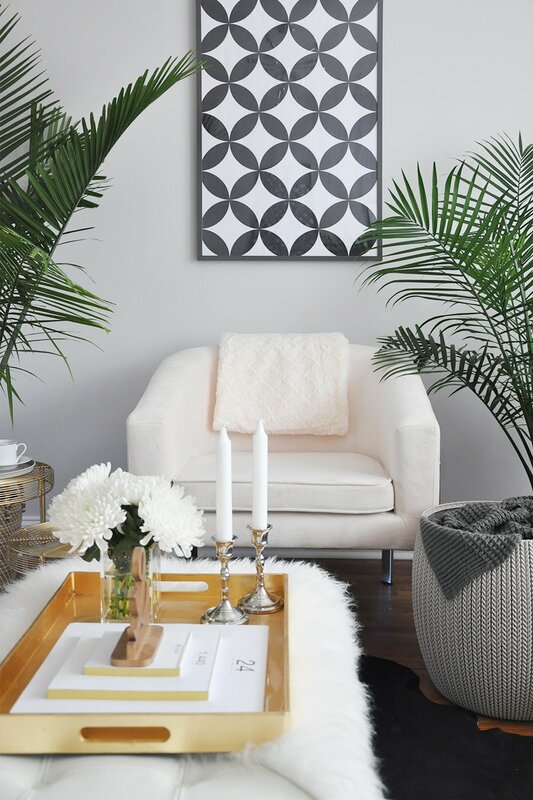 The artwork around the corner and the fireplace decor … love both of those! Seriously beautiful makeover!! Love!!! Amazing transformation, especially that fireplace!!! You know I already love your furniture choices. 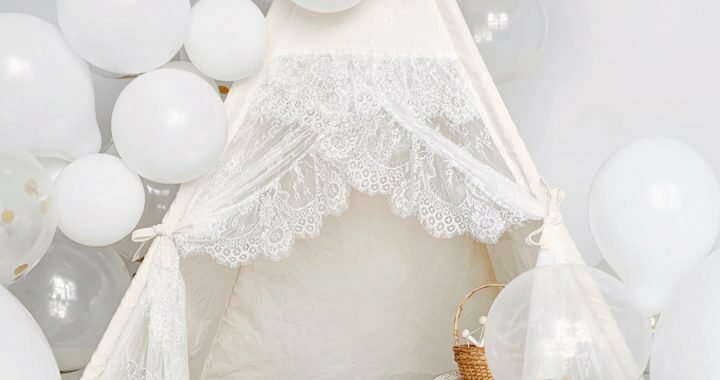 You did an incredible job with all of the details and your DIY skills are on point! Love the gold accents! Fabulous job! Thank you so much, Kristine! We’re definitely on the same wavelength – what with the tufted sofa, velvet chairs, fireplace makeover… Although I must say, in the few weeks that we’ve had the cream velvet chairs, I can understand why you decided to go with gray instead – those things are impossible to keep clean! Oksana, this is STUNNING! 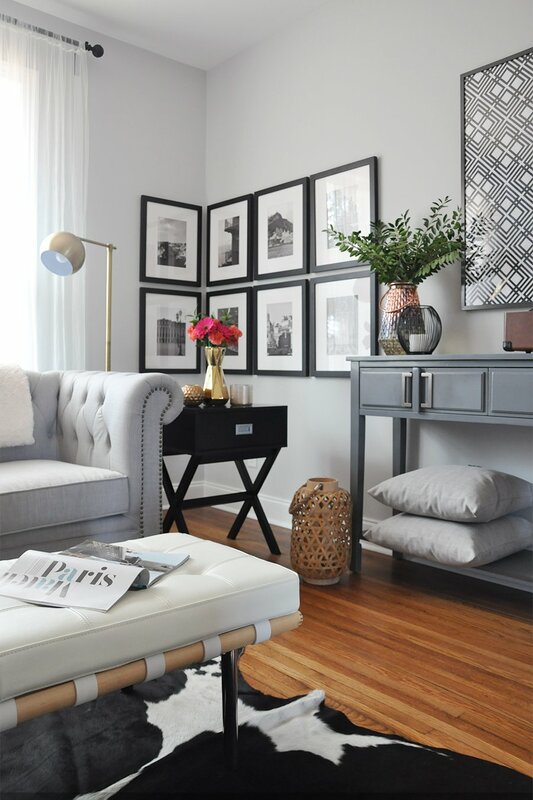 I love that ottoman/bench and love how you wrapped the artwork around that corner- great idea! Cassie thank you so much! The gallery wall placement was totally last minute – a decision I wasn’t too sure about – so it makes me so happy to receive so many compliments on it! Oh my gosh!!! I love love love your house. I’m obsessed!!! Oh my gosh, Oksana, your new space is stunning! Can’t believe you accomplished this in a mere 6 weeks! LOVE that fireplace and how you wrapped the gallery wall around into the corner even. So chic! What a fun story about your property! 7 acres, I am totally jealous. And a sputnik just works so well in that era home! Love how your room turned out! Glitz and glam and gorgeousness! Seriously swooning Oksana! This is amazing and I’m loving the big reveal! Brava, my friend! So glad to connect – you have amazing talent! Everything looks just beautiful…. and oh, your name! It was the name of my first and very dear paper doll when a little girl growing in a far away country! I loved her so much, I still remember after all those years, ;) So lovely. So sophisticated! The gallery wall is pure perfection. I love how it wraps around the corner. 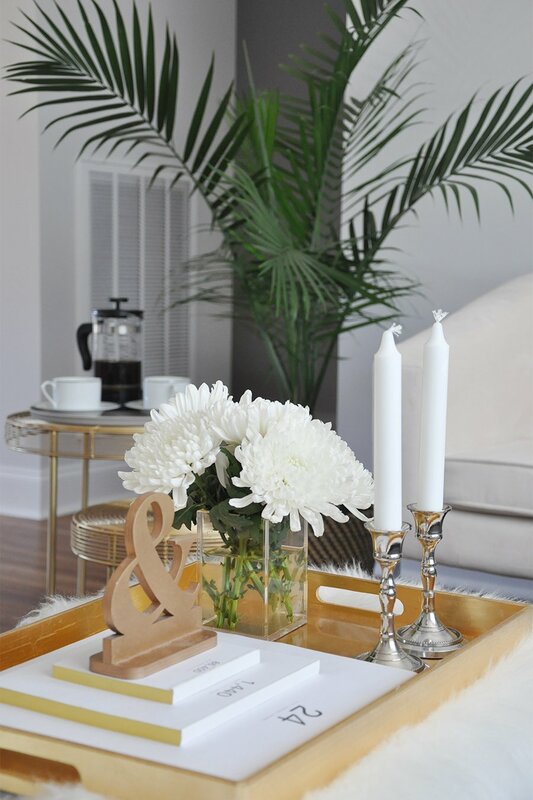 The overall room and styling is polished and beautiful! Love it! Love it! One of my favorite ORC makeover so far!!! The fireplace is just perfect as the colour palette! Oh gosh….this is stunning. Everything is soo beautifuly arranged! Love the choice of furniture and its placement! Goregeous, in every possible way! Oh Besa, you’ve no idea how much your comment means to me! The furniture arrangement was such a big stressor for me – I’m pretty sure I tried 10 different layouts! WOW! I’m still impressed with the story of the house and how much work it took to get to this point. I can’t image how awesome it will feel tomorrow when you wake up and a room is totally done and decorated. I’m still obsessed with the sofa, and the barrel chairs, and every other thing in the room! The furniture arrangement looks like it was your plan all along! And now I’m off to pin everything in your room! Oksana, ok where do I start?!! The furniture placement is perfect and I love the fireplace! Oh my gosh, it was totally worth the late night last minute painting bc it looks awesome! Your style has me swooning and I love all of your details like the travel photographs that wrap around the wall. That is genius! Thanks for sharing your beautiful talent and style with us. I’m so glad I got to know you better through the ORC! PS: please teach me how to take photography like you!! I’m in awe!